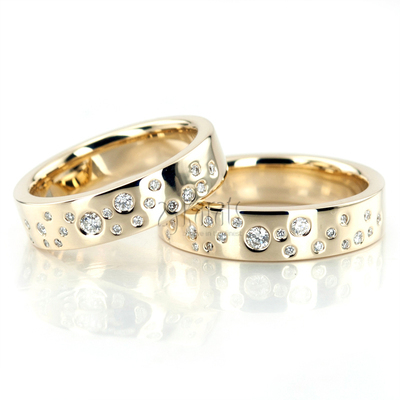 A lovely modern design, this 5mm Diamond Wedding Ring set's each ring is furnished with cluster diamonds covering it half way around. Set with 21 round diamonds, total carat weight is 0.17ct. Band is high polished. 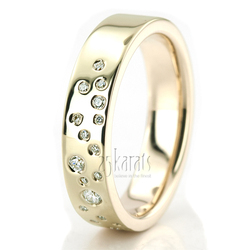 Diamond size 1: 17 pieces x 1.0mm Round cut with Burnish Set - G/H Color - SI1 Clarity - 0.085 ct.tw. Diamond size 2: 17 pieces x 1.0mm Round cut with Burnish Set - G/H Color - SI1 Clarity - 0.085 ct.tw. Diamond size 3: 2 pieces x 1.3mm Round cut with Burnish Set - G/H Color - SI1 Clarity - 0.02 ct.tw. Diamond size 4: 2 pieces x 1.3mm Round cut with Burnish Set - G/H Color - SI1 Clarity - 0.02 ct.tw. 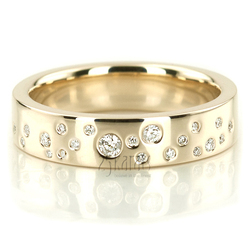 Diamond size 5: 1 piece x 1.8mm Round cut with Burnish Set - G/H Color - SI1 Clarity - 0.025 ct.tw. Diamond size 6: 1 piece x 1.8mm Round cut with Burnish Set - G/H Color - SI1 Clarity - 0.025 ct.tw. Diamond size 7: 1 piece x 2.2mm Round cut with Burnish Set - G/H Color - SI1 Clarity - 0.04 ct.tw. Diamond size 8: 1 piece x 2.2mm Round cut with Burnish Set - G/H Color - SI1 Clarity - 0.04 ct.tw.